Browning Camping Big Horn 5 Person Tent is the new name for their Browning Camping Ridge Creek 5 Person Tent which is a model they launched a few months ago. Read more here. 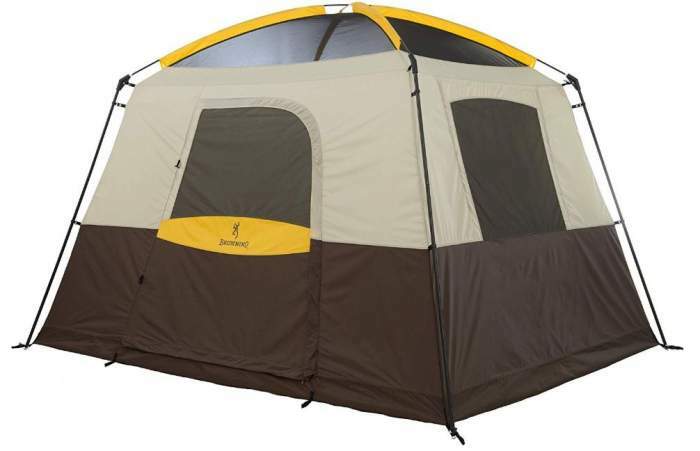 Browning Camping Big Horn 5 Person Tent. Check on Amazon, they usually have the best prices and this link will redirect you to your local Amazon store so you might save a lot on shipping. Browning Camping has launched a tent just a few months ago under the name Browning Camping Ridge Creek 5 Person Tent, so I wrote a review when it appeared. If you have a look you will realize that the tent was interesting for readers and the text received some comments. But they have decided to change its name, and it is now as you have seen in the title, the Browning Camping Big Horn Tent 5. In fact, this is a reasonable step because this is just a single room version of their famous Browning Camping Big Horn Tent 8. You will realize this if you have a look at it, the same style and colors. I have contacted the brand and they confirmed this, so in the reply, their representative told me that they still have the inventory of the Ridge Creek 5 and they will sell it under that name on their site until it is gone. So for a while, there will be the same tent with two names on the market. But on Amazon, now it is only the Big Horn 5. Eventually, it will be only the Big Horn 5 of course. In any case, this Big Horn 5 is a pleasant and freestanding 5-person tent, with a partial coverage fly, see the picture below, which buckles to its corners, and you can rotate the tent and move it around even with the fly. So indeed you can set it up anywhere but I would not use it without staking it down properly. Big Horn 5 Person Tent shown without the fly. As you realize from the pictures, this is a cabin style tent with straight and steep walls, ideal for campers who use cots. 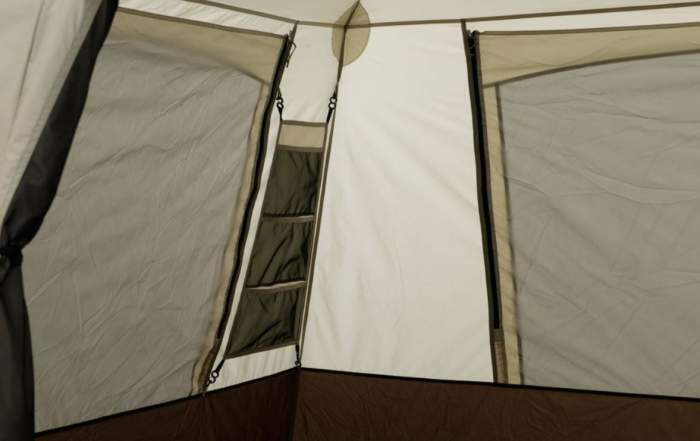 This is a very tall tent with the peak height of 7 ft (213 cm), the door is high and you have a brim above, so you have an easy access which allows lots of room to stand up. You have three separate windows plus one on the single door shown above, all of them with mesh and panels. So this is why the fly is designed small, to allow for unobstructed views. Space-wise, the declared capacity is 5 people, and the tent offers 80 ft² (7.4 m²). The dimensions are such that you can indeed squeeze 5 pads on the floor, but this can work only if you are with friends on some open-air festival or any similar activity. In the case of camping, this is a tent for two people, for a pair of campers or hunters, or for parents with a small kid. There is no vestibule for gear, so all the stuff must be kept inside or in the car. Weight-wise, with its 21 lb (9.5 kg) this tent is everything but lightweight, but this is not an issue. This is a car camping tent and it is built for comfort, so it is not supposed to be carried anywhere. My rating for weight is low (see below) but I use the same criteria for all tents for comparison purpose, and you can simply ignore the weight. Climate-wise and seasons-wise, this is a 2-season tent and best suited for a warmer environment, say summer, late spring and early autumn. The ceiling is all mesh so you will not feel great if you use it in a cool climate. But can you? Sure you can, I am only talking about comfort, this is a reliable tent in general. The fly protects the ceiling only but the walls are waterproof. The construction is strong but this is a very tall structure and there are not enough stake points, so I would avoid using it in a windy area. Here you have a combination of steel used for the four legs, and fiberglass on the roof. This is a simple construction with plastic joints and sleeves on the top, fully self-supporting and freestanding. But such a roof is not for snow accumulated on it, just to know. Fiberglass poles in the roof sleeves. The fly is a 75D 185T polyester designed to resist UV damage and stays taut, but they did not provide the waterproof rating. Most likely this is 1500 mm, they use this in their other tents. The floor is a much stronger 150D polyester oxford with 2000 mm coating. All the seams on the fly and the floor are factory-sealed and this is really properly done, so the tent is very reliable. Note that the inner panels on the windows are with zippers, so you can position them as high as you wish for privacy and protection. There are no floor vents here. You might think you do not need them with such a ceiling and you are probably right if the sky is clear. But in rain, you have to zip up the door panel. The tent easily fits into its carry bag. One person can set it up in 10 minutes, with two people it is much easier and faster. Mesh storage shelf is included, see the picture below. Guy ropes are in the package. Zippers on the window panels, and the organizer system on the wall. Type: cabin style freestanding tent. Weight: 21 lb (9.5 kg). Dimensions: 10 x 8 ft (305 x 244 cm). Area: 80 ft² (7.4 m²). Area per person: 16 ft² (1.5 m²). Peak height: 7 ft (213 cm). Packed size (L x D): 28 x 8 in (71 x 20 cm). So this Browning Camping Big Horn 5 Person Tent is nicely built, the waterproof rating may not look big and the fly is minimal but the tent is properly sealed and this is what matters. Most of the time tents leak through seams so the fabric waterproof rating becomes meaningless, but this is not so here and you can rely on it. It is best to ignore the declared capacity and use this tent for couples. To see more tents for 5 people, please check my list of best 5-person camping tents where this tent is also included. You have seen that it is very tall, but if you still need something taller, check my list with extra tall camping tents, all above 215 cm. If you need something slightly bigger, check this Eureka Jade Canyon 6 tent full of great features. Need something portable and with the same capacity? No problem, check this NTK Hunter GT 5 to 6 people tent. Note that this is not a sponsored text and I am not paid by the manufacturer. Thank you for reading. Do you have any first-hand experience with this tent? Please share it here, there is a comment box below. Have a nice day. The stove I have is made by KniCo as a special version they manufacture for the maker of my canvas tent Beckel Canvas Products, here in Portland, OR. It is pretty much the same as the KniCo Alaskan https://www.kni-co.com/index.php?route=product/category&path=66 with a few different features, chiefly having the stovepipe hole exit out of the backside of the stove instead of the top. (Beckel strongly prefers stove pipes exiting through the side of the tent instead of the roof and this design works better for that.) it is really too big of a stove for the size of tent we have been talking about, but it is what I have, so I will make do with it for now. I had considered the Coleman Instant Tent you are referencing. I had a few concerns with it that made me think the Alps Camp Creek would be better. Mainly, it seems like the walls slope inward less on the Alps than on most of the instant tents, so that would seem better and the size is a touch bigger. With the stove being on the large size, it seems like it would be good to have it be as big as possible. Also, some of the reviews of the Coleman quality control are concerning, if they are to be believed. Also, it seems like Alps has the reputation for better customer service. The price of the Alps now on Amazon at $162 seems a better value, especially if one did opt for the optional rainfly for the Coleman at additional cost. The Alps has a nicer floor of course too….. There would be some additional cost to make the panels for the Alps, but I have some spare fabric, so not really for me. Besides, with that big stove, I may not need the panels anyway! Anyway sorry for the rambling again and I welcome any other thoughts/advice. Thanks JV! Many thanks Brian for this information. I agree with all you said. This about drying is what people frequently forget. So if you plan to heat the tent it should be an enclosed design. The only that have such a structure are tunnel tents. They are usually big structures with separate rooms, but you might consider some of those for 5 people. The point is they have PVC windows and some have a sewn-in floor so the warmth will be preserved. Some other models have the floor removable, which may also be good under the stove only. My feeling is these tents are not so popular in the US but they are on the EU market. Vango has them many, but there are several by Coleman (built for EU market). But they have been appearing on the US market recently. In most cases the waterproof rating is huge, Vango is a Scotish brand, so no surprise. You might consider those where you would pass the pipe stove through the vertical wall side, this means without a deep porch. How about this Coleman Rocky Mountain 5 Plus? Good review….. thanks. One comment is that maybe the Alps Mountaineering Camp Creek shown as a comparison tent should be the 10×10 version instead of the 10×12 version. It seems like that would be a more comparable model in size, number of rooms, poles, etc. Thank you Brian, yes you are right. Though the single room version of Alps Mountaineering Camp Creek is too similar so I wanted to show some versatility in choices. In fact, those two brands have the same owner. But I realize from your comment that showing the 2-room tent was not a smart choice as it is a 6-person tent. So I am going to add another tent with the same declared 5-person capacity, the Oxley Lite 5. Much appreciated. Thanks JV. The Browning and Alps Camp Creek 6 seem very close and there is a definite “family resemblance”. The Browning is smaller, but more expensive. Is there any reason that I would not choose the Alps over the Browning? Are they marketing the Browning as a more premium brand than the Alps? BTW, I do have a 2 man Alps Lynx 2 backpacking tent. It is not ultralight, but an incredible value and has performed really well. I am impressed with the price/performance ratio of the brand. It is hard to say if Browning is more premium, but my feeling is that this is how people see it. I am a bit familiar with Lynx 2, this is a classic already, at least 6 years around, yes you are right this is not a backpacking tent. But many share your opinion about the price/performance combination. Wonder about your experience with the fly windows. Have you been using the tent for a long time, will the windows crack in time? I have only had the Lynx 2 for about a year and, having several other tents, I have not used it that much yet. I also had concerns about the windows when I bought it. I am thinking somebody at Alps must think they are a cool idea, but I think they are kind of dumb. Given the choice, I really would have preferred that they not be there. I am told that they can be repaired with a clear repair tape that is made for the plastic windows that are in convertible cars. I also don’t like that it would seem that people could peek in, which is probably more imagined than real. I have thought about covering them with black Gorilla tape with a layer on each side. The windows also make for a “stiff area” when rolling the fly up. I don’t think stuffing the fly would be a good idea with the windows. As it is, the windows pretty much have to have some creases in them to roll the fly up if one wants to fit the fly in the bag. The strong points of good headroom, surprisingly good construction quality, aluminum poles, good fly venting, nice smooth zippers, (mostly) earth tone colors and that it was less than 80 dollars + shipping all offset the downside of the windows…. I just could not pass it up and am quite happy with it. I have had it out in some pretty good rain and it has been as dry as a bone….. I am happy with the brand and think I am going to buy a Camp Creek 6…… I have a wood stove that I use in a large canvas tent I have. That tent is too big and difficult to deal with for short trips, so I am thinking I will put a stove jack through one of the sidewalls of the Camp Creek 6. As you have pointed out, these types of cabin tents are not really designed for winter use with all of that roof mesh, but I am thinking I can easily make some removable nylon panels to cover the majority of the mesh area. Actually, when the wood stove is going, it will probably be too hot and I will need to open the windows….. Sorry for the rambling……. and thanks for your excellent efforts on the web site. I like it s lot! Thank you again Brian, it is really interesting to read your thoughts about the Lynx 2 and its fly windows. This thinking applies to all tents with such a design. Curious to know which wood stove you are using. So if you would go for such a lighter cabin option instead of the canvas tent which you have, you might want to consider the Coleman Instant Cabin 6 because of its ceiling which is not mesh so it will perform better for such a purpose, and it is also instant setup. 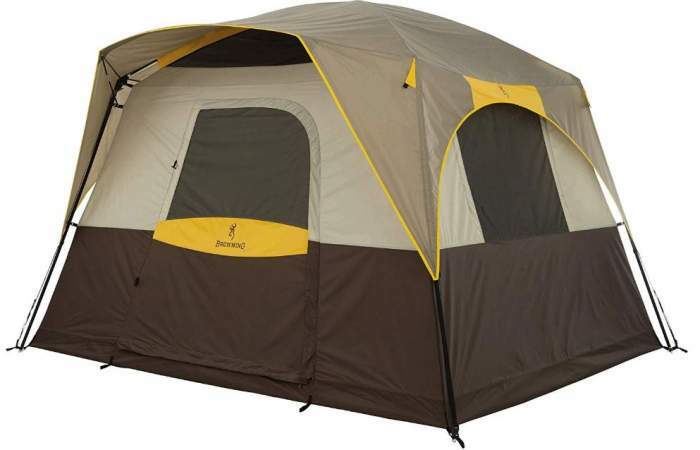 Yet another option is this Ozark Trail 6-Person Dark Rest Instant Cabin Tent because of the ceiling which is closed. By the way, it also has fly windows. But I do not think those tents are as reliable as the Alps Mountaineering tents.